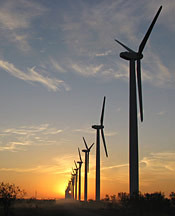 The American Wind Energy Association is a national trade association representing companies in all aspects of the wind energy industry, including project developers, turbine manufacturers, and utilities. North American Windpower has recent news about the industry, job postings, and a free print subscription. The Solar Energy Industries Association is the US trade association for solar energy and related businesses. Solarbuzz tracks global solar market and supply developments. The Energy Information Administration provides important data and statistics for the entire energy industry. WINDExchange is a resource of the U.S. Department of Energy’s Wind Energy Technologies Office.